Today during spooky reads week I had the opportunity to interview an awesome horror writer Joe McKinney. His new book is an anthology with five other others. Stay tuned for a giveaway at the end of this post. 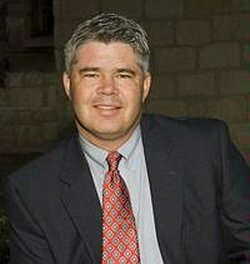 Joe McKinney has been a patrol officer for the San Antonio Police Department, a homicide detective, a disaster mitigation specialist, a patrol commander, and a successful novelist. His books include the four part Dead World series, Quarantined, Inheritance, Lost Girl of the Lake, Crooked House and Dodging Bullets. His short fiction has been collected in The Red Empire and Other Stories and Dating in Dead World and Other Stories. In 2011, McKinney received the Horror Writers Association's Bram Stoker Award for Best Novel. What`s the best thing about being a writer? Being able to look up anything you want online and being able to convince your spouse that it was “purely for research purposes.”Just kidding. I’m a cop, so I can do that already. But if I were to give you a serious answer, I think it would be that I get to indulge my love of play…and get paid for it. Seriously, I can create any world I want, and people it with whomever I want, and get paid for it. Imagine indulging your inner child that way. Who else gets to have that kind of fun at work? Why Horror as your genre? You know, I honestly believe that you don’t find the genre, it finds you. Like water sinking to its lowest level, if you have to get something out, you find the genre that works for you. For me, that level has always been a dark place. Maybe it’s the cop in me, or maybe it’s something else, but horror is what comes out, no matter what story I try to tell. It’s a mystery, I guess. Has working as an editor helped you write your won books? Yes, for a couple of reasons. First of all, it’s made me appreciate the value of a word count. It’s taught me that books are put together on a budget, and that you have to make decisions about what to leave in, and what to leave out. Just like that Bob Segar song. As a writer, who has worked as a frustrated editor, that one point alone has made me more professional about the business side of my craft. Secondly, it’s taught me to appreciate the nuances of an author’s voice. It’s one thing to try and fix a problem story, and quite another to revel in a perfectly crafted gem. Being an editor is a lot like being a coach of a pro sports team. Individual players may be held accountable for their efforts, but you, the coach, are held accountable for the performance of the team. And when you’re building an anthology, you have to think of collecting stories that way. They are players, and you are the coach. In your bio you talk about how law enforcement is huge in your books as well as real life do you think having that in your book draws more readers to you? I don’t know. It’s a rough time these days for law enforcement. I get a lot of trolls hitting me up with bad reviews on various sites just because of the pro-law enforcement angle I take in most of my fiction. But I also get a lot of really positive feedback from folks who see the law enforcement angle as an important part of our present day national discussion. I just roll with it, one way or the other. I will tell you that, from an authorial point of view, it has been hugely important. Most horror books create situations in which, if you’re going to maintain any sort of verisimilitude at all, you’re going to have to bring in the cops. You can’t have a barn full of corpses without the cops showing up eventually, right?Well, most horror writers get to that point, and don’t know what to do. Okay, the cops are here, now what? If they solve the case, the story is done, the horror over. If they get killed, more cops show up. Lots of cops, in fact. So they find silly ways of getting the cops off the stage and out of the story.I’m not that way. I usually start my stories at that point. Since you grew up with horror what is one book or series you would recommend to really get a reader into horror? Boy’s Life by Robert McCammon. McCammon is my literary hero, and Boy’s Life might very well be the best thing he’s ever written. For me, encountering the book at the age of, I think, about fifteen, it was a true monkey-touch-the-monolith kind of moment. All things horror made sense at that point. So has your daughter read your books yet or still too young? She’s read a few of them. Dog Days and Dead City, certainly, and I think she’s snuck a few others upstairs to read without us knowing about it, but certainly not all of them. She’s really not a horror fan. More of a science fiction fan.Good news about that, though, is that she’ll have a lot more of my stuff to read in the coming years, as Young Adult Science Fiction is next up on my To Be Written list. 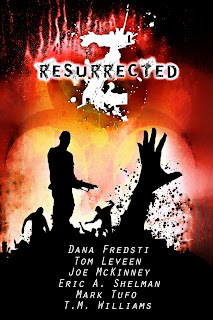 In this anthology, six horror authors revisit some of their most infamous zombie characters, resurrecting the undead. Contributing authors to Z Resurrected are some of horror’s best, who have each carved a distinct path in the world of zombies: Dana Fredsti, Tom Leveen, Joe McKinney, Eric A. Shelman, Mark Tufo, and T.M. Williams. Be sure to check out the other hosts after entering the giveaway. I'm really excited about this sci fi road you'll be taking Joe!